Linda, a native of Boston, Massachusetts, procured her Bachelor’s Degree in Jazz Performance from the University of North Texas. In addition, Linda earned an ATP Diploma in Audio Technology from the SAE Institute of Los Angeles, and holds other various Certificates in Digital Audio and Electronic Music Production. 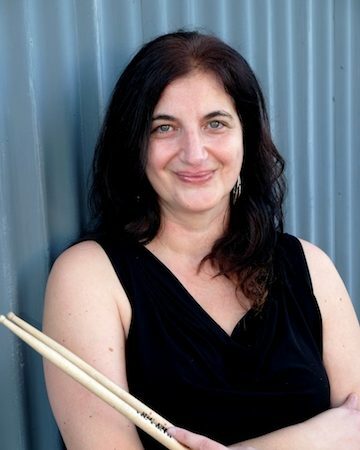 She is a drumset artist with a rich history of performing credits in the United States and Europe that include performances with jazz artists Peter Herbert, Wolfgang Muthspiel, George Garzone, Frank Mobus, Carolina Brandes, Christian Diener, John Lockwood, and Eugene Maslov. She has also shared the stage with opening performances for Major Label Country Artists: Alan Jackson, Gretchen Wilson, Tracy Byrd, Josh Turner, and Julie Roberts. She has studied extensively with Internationally Renowned Artists/Educators, Gary Chaffee, Alan Dawson, and Dr. Robert Schietroma. Her tapestry of teaching includes being a former percussion faculty instructor for Berklee College of Music and drumset clinician for SABIAN, LTD.
Linda has long been known to be very generous in giving to her students all the knowledge she has accumulated over the years, eager to pass it on and inspire others to think big, reach high, and dream vivaciously.